Areas of Specialty: Dr. Andropoulos is a board certified anesthesiologist and pediatrician, specializing in the effects of anesthetic and sedative exposure on quantitative brain MRI development and neurodevelopmental outcomes. Research and Clinical Activities: Dr. Andropoulos has held various positions in the anesthesiology and pediatric departments at multiple universities, including Baylor College of Medicine; University of California, San Francisco; University of California, Davis; and Stanford University School of Medicine. Currently, as the Chief of Pediatric Anesthesiology and the Attending Physician of the Pediatric Cardiovascular Intensive Care Unit at Texas Children’s Hospital, Dr. Andropoulos specializes in monitoring neonates and infants undergoing surgery for congenital heart disease. His research activities include neurodevelopmental outcomes of anesthetic and sedative exposure in infants and neonates, as well as the long-lasting effects of treatment for congenital and pediatric cardiac disease. Dr. Andropoulos is the editor of two textbooks, Anesthesia for Congenital Heart Disease and Gregory’s Pediatric Anesthesia. 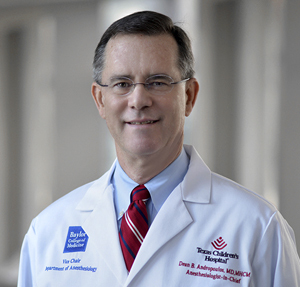 He leads a department of over 50 faculty pediatric anesthesiologists, who perform more than 32,000 anesthetics annually, ranging from simple outpatient procedures to extremely complicated cardiac and neurosurgical anesthetics, lasting more than 12 hours. Dr. Andropoulos has conducted over 170 presentations, invited lectures, and visiting professorships, and authored numerous peer-reviewed publications. His vast expertise and experience offer significant contributions to the SmartTots Scientific Advisory Board. The question of the effect of anesthetics in the developing child’s brain, and their influence on neurodevelopmental outcome and school performance, is in my opinion the most important scientific, translational, and clinical question facing pediatric anesthesiology, and anesthesiology in general, in this generation. The answers to the questions of what are the true effects of these agents in children and what treatment strategies can be used, including different anesthetic agents to optimize the neurodevelopmental outcomes after an anesthetic, can potentially affect millions of children each year undergoing anesthesia. What goals would you like to see SmartTots accomplish? I would like to see SmartTots identify and fund meritorious research that will answer questions, and lead to clinical strategies, in children that will optimize neurodevelopmental outcomes after anesthesia and sedation. SmartTots should educate anesthesia providers and the public, particularly parents, about the latest research and data. SmartTots should also convene meetings and symposia to review data and levels of evidence, and make recommendations based on a sound scientific process. Certainly, methods to financially support this important FDA-IARS public-private partnership is a great way for the public to be involved. The public can be informed by being aware of the press, scientific releases, and news stories concerning SmartTots. Andropoulos DB, Heard MB, Johnson KL, Clarke JT, Rowe, RW. Post-anesthetic apnea in full-term infants after pyloromyotomy. Anesthesiology 1994 Jan;80(1):216-9. Andropoulos DB, Rowe RW, Betts J. Anesthetic and surgical airway management during tracheoesophageal fistula repair. Paediatric Anaesthesia 1998;8:313-9. Pressure control ventilation: three anesthesia ventilators compared using an infant lung model.Anesth Analg 2000;91:1145-50. Rivenes SM, Lewin MB, Stayer SA, Bent ST, Schoenig HM, McKenzie ED, Fraser CD, Andropoulos DB. Cardiovascular effects of sevoflurane, isoflurane, halothane, and fentanyl/midazolam in children with congenital heart disease: an echocardiographic study of myocardial contractility and hemodynamics.Anesthesiology 2001;94:223-9. Laird TH, Stayer SA, Rivenes SM, Lewin MB, McKenzie ED, Fraser CD, Andropoulos DB. Pulmonary-to-systemic blood flow ratio effects of sevoflurane, isoflurane, halothane, and fentanyl/midazolam in children with congenital heart disease.Anesth Analg 2002;95:1200-6. Andropoulos DB, Stayer SA, Skjonsby BS, East DL, McKenzie ED, Fraser CD.Anesthetic and perioperative outcome of teenagers and adults with congenital heart disease. J Cardiothorac Vasc Anesth 2002;16:731-6. Ikemba CM, Stayer SA, Miller-Hance WC, Eidem BW, Su JT, Bezold LI, Hall SR, Havemann L, Andropoulos DB. Myocardial performance index with sevoflurane vs. fentanyl/midazolam in infants with a single functional ventricle.Anesthesiology 2004;101:1298-1305. Akpek EA, Miller-Hance WC, Stayer SA, Rice CL, East DL, Fraser CD, McKenzie ED, Andropoulos DB. Anesthetic management and outcome of late corrective operations for patients with transposition of the great arteries and a systemic right ventricle. J Cardiothorac Vasc Anes 2005;19:322-28. Diaz LK, Akpek EA, Dinavahi R, Andropoulos DB. Tracheoesophageal fistula and associated congenital heart disease: implications for anesthetic management and survival. Paediatr Anaesth 2005;15:862-9. Diaz LK, Andropoulos DB. New developments in pediatric cardiac anesthesia.Anes Clin N Amer 2005;23:655-76. Vener DF, Tirotta CF, Andropoulos D, Barach P. Anesthetic complications associated with the treatment of patients with congenital cardiac disease: consensus definitions from the Multi-Societal Database Committee for Pediatric and Congenital Heart Disease. Cardiol Young 2008;18(Suppl. 2):271-81. Vener DF, Jacobs JP, Schindler E. Maruszewski B, Andropoulos D. Databases for assessing the outcomes of the treatment of patients with congenital and pediatric cardiac disease—the perspective of anesthesia. Cardiol Young 2008;18(Suppl. 2):124-9. Andropoulos DB, Hunter JV, Stayer SA, Nelson DP, Stark AR, Heinle JS, McKenzie ED, Graves DR, Fraser CD. Brain immaturity is associated with brain MRI injury before and after neonatal cardiac surgery with high-flow bypass and cerebral oxygenation monitoring. J Thorac Cardiovasc Surg 2010;139(3):543-56. Andropoulos DB, Mizrahi E, Hrachovy R, Stayer SA, Stark AR, Heinle JS, McKenzie ED, Dickerson HA, Meador MR, Fraser CD. Electroencephalographic seizures after neonatal cardiac surgery with high flow cardiopulmonary bypass and cerebral oxygenation monitoring. Anesth Analg 2010;110(6):1680-5. Kaltman JR, Andropoulos DB, Checchia PA, Gaynor JW, Hoffman T, Laussen P, Ohye R, Pearson G, Pigula F, Tweddell J, Wernovsky G, del Nido P, for the Perioperative Working Group. Report of the Pediatric Heart Network and National Heart, Lung, and Blood Institute Working Group on the Perioperative Management of Congenital Heart Disease. Circulation 2010;121:2766-72. Andropoulos DB, Brady KM, Easley RB, Fraser CD. Neuroprotection in pediatric cardiac surgery: what is on the horizon? Prog Pediatr Cardiol 2010;29:113-122.